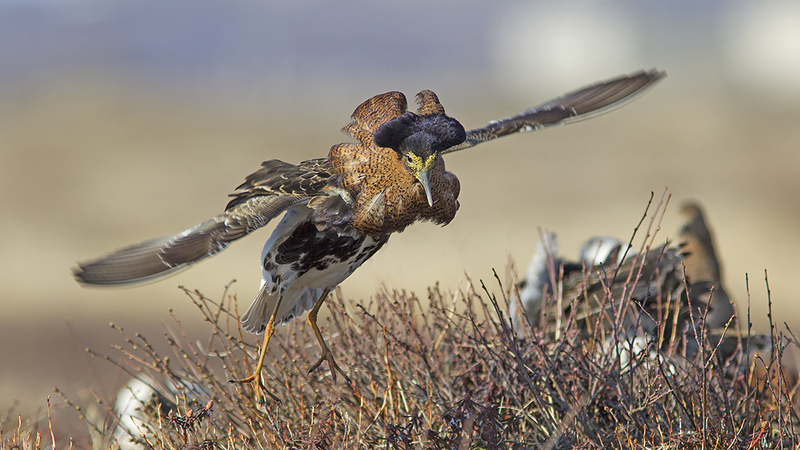 Ruff on the lek – not an easy thing to photograph around here. One of the great joys of travelling to faraway places with only one single objective, in this case to photograph birds and nature, is that one can really immerse oneself in the endeavour. At home, or on trips with more objectives, there is always a clock ticking and something else waiting. This wasn’t the case on my Siberian trip. When we weren’t out on the big SBS caterpillar tour we were based in the unusual town called Ugolnye Kopi – it has been described in an earlier blog entry. The place is absolutely teeming with bird life in the beginning of June; there were several Ruff-leks within walking distance of the hostel. I visited this lek on two occasions, once from the East and once from the West. My approach options were limited by the terrain – from these two sides I could sneak up on the birds by using the relief in the mostly flat tundra area. Both times I was there I spent a couple of hours just lying on my belly with my camera in front of me, enjoying the spectacle, and getting increasingly frustrated by the fact that there was a small knoll on the lek which the birds would invariably be behind when they were fighting, meaning the very great majority of my images had too much vegetation between the camera and the birds – but a few turned out all right. This gallery celebrates the drag-queen nature of the Ruffs on the lek – click on an image to view it in large size, and feel free to share your thoughts on the subject below the actual post.